The Best Philippines Wedding Blogs from thousands of Wedding blogs and Wedding magazines on the web using search and social metrics. Subscribe to these websites because they are actively working to educate, inspire, and empower their readers with frequent updates and high-quality information. Philippines Wedding newsletter is a comprehensive summary of the day's most important blog posts and news articles from the best Philippines Wedding websites on the web, and delivered to your email inbox each morning. To subscribe, simply provide us with your email address. About Blog Bride and Breakfast is a wedding resource committed to style, taste, and beauty. We feature only the most stylish, gorgeous and magazine-worthy weddings in the Metro, tapping the crème-de-la-crème of wedding suppliers (both seasoned and upcoming), and showcasing inspiring ideas that can help make your wedding fashionably chic and character-filled. Facebook fans 319,887. Twitter followers 2,833. About Blog Everything Wedding. All in one place. We are on a mission to empower engaged couples to make the best choice in their wedding planning from providing viable inspirations, setting the budget, up to selecting a team of Wedding Professional Suppliers. Facebook fans 100,114. Twitter followers 101. Philippines About Blog Merry to Marry is your ultimate guide to making your dream wedding come into fruition. If you are someone who dreams to become a PRINCESS BRIDE, a groom-to-be who wants to unleash the Richard Gere in you and RUNAWAY with your BRIDE, or a girl (or a guy) who is just plain believer of fairy tales, then this is the blog for you. Facebook fans 43,352. Twitter followers 35. About Blog Foreveryday Photography is one of the best wedding photographers in Manila, Philippines. Revel in romance with our beautiful & timeless wedding photographs. Our photos show love & beauty woven together elements that exist with each other in our workplace in front of a couple in love. Facebook fans 34,806. Twitter followers 126. Manila, Philippines About Blog The Top Knotters is an all-around Philippine wedding blog resource for inspiration and preparation ideas for soon-to-weds with wedding tips that matter. Facebook fans 10,175. Twitter followers 248. City of Pasig Philippines About Blog Philippine wedding photographer and videography with expertise in aerial videography, infrared photography, debut, birthday, baptismal, party, social functions. Facebook fans 4,504. Twitter followers 38. Manila, Philippines About Blog Leading online wedding resource for Filipino brides anywhere in the world. Facebook fans 58,548. Twitter followers 1,152. Manila, Philippines About Blog RoyAnne Camillia Couture is a Manila and online-based clothing line that caters to RTW, rentals and custom-made pieces and accessories women. Facebook fans 136,517. Twitter followers 13. Quezon City About Blog Juan Carlo has long been recognized in the wedding catering industry for its quality cuisine and service that is a cut above the rest. Their blog is all about providing the best bespoke dining experience your wedding guests deserve. Facebook fans 44,982. Twitter followers 1,122. Facebook fans 785. Twitter followers 2,392. 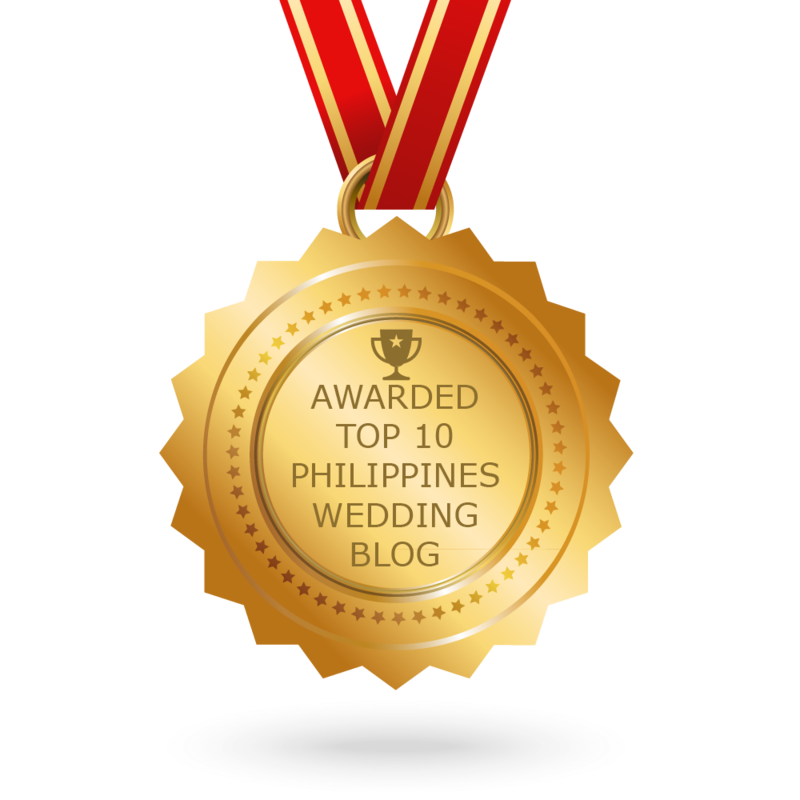 CONGRATULATIONS to every blogger that has made this Top Philippines Wedding Blogs list! This is the most comprehensive list of best Philippines Wedding blogs on the internet and I’m honoured to have you as part of this! I personally give you a high-five and want to thank you for your contribution to this world.